"280 feet south of this location on June 18, 1862, seven of the Union Army's brave Andrews Raiders were hanged and buried. On April 12, 1862, 22 Andrews Raiders seized The General, a tender and three boxcars at Big Shanty (now Kennesaw) and raced toward Chattanooga on the Western & Atlantic Railroad in an effort to burn bridges and otherwise dismember a supply artery vital to the Confederacy. They had covered 87 miles when The General was overtaken by valiant pursuers led by Conductor Fuller. Of the Raiders, only these seven plus James J. Andrews, their leader, were executed by the Confederate Army. 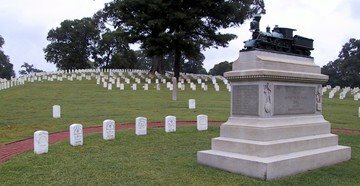 In 1866, remains of the seven were exhumed from this location and reinterred at the National Cemetery at Chattanooga. Andrews' remains were reinterred at the National Cemetery in 1887. The first awards of the Congressional Medal of Honor were made to members of the Andrews Raiders. · John M. Scott - 21st Ohio Vol. Inf. · Marion A. Ross - 2nd Ohio Vol. Inf. · Samuel Robertson - 33rd Ohio Vol. Inf. · Charles P. Shadrack - 2nd Ohio Vol. Inf. · Samuel Slavens - 33rd Ohio Vol. Inf. · George D. Wilson - 2nd Ohio Vol. Inf. · William H. Campbell - Civilian, Salineville, O.
James J. Andrews - Civilian, Flemingsburg, KY."